Maurice Braun, who was raised in New York City, honed his natural art abilities with five years study at the National Academy of Design in that city. After a brief career as a portrait and figure painter, his interest in Theosophy led him to settle in San Diego, where the Theosophical Society had its headquarters in Point Loma. For the rest of his life he painted landscapes there, although he made some ventures into still life in the 1930s. Landscape, a large work and obviously important to Braun, perhaps an exhibition piece, is in the full Impressionist style as it was practiced on the East Coast just after the turn of the century. The subject -- autumn woods and fields -- was one popular with his peers James Francis Murphy, Emil Carlsen, and others. The woods in this picture are definitely East Coast, probably Connecticut, which would have been easily accessible from Manhattan. Unknown, however, is the painting’s date. This author assumes, because of the superior drawing, that the work was created shortly after Braun emerged from art school, where drawing is emphasized. Braun’s later brushwork progressively weakens as his career unfolds, becoming almost mushy by the 1930s. 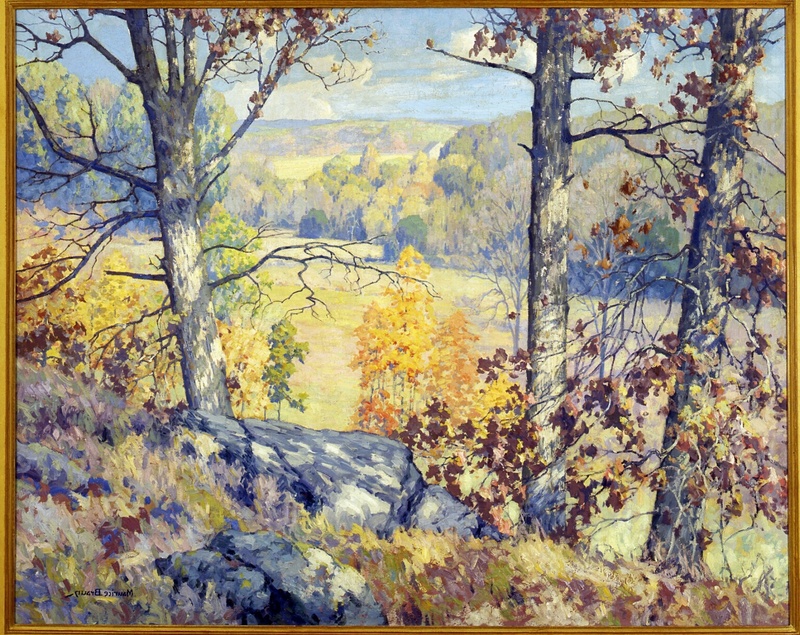 But other scholars look at the painting’s Connecticut subject matter and date it in the early 1930s when Braun made a special trip to that state to paint. A catalogue raisonne will hopefully segregate Braun’s crisply painted East Coast woodlands as a movement in itself and distinct from the works he produced on his 1930s trip. Provenance, exhibitions, publications: Joe Moure who purchased it from Biltmore Galleries, L.A. in 1984, who purchased it from a Scottsdale dealer, who obtained it from daughter of Harry B. Waggoner, who obtained it from Braun. Exhibited Los Angeles County Museum of Art, American Art Galleries, 1990s; exhibited Masterworks of San Diego Painting: Fifty Works from Fifty Years, 1900-1950, Oceanside Museum, 2008.